The state government today decided to provide one-year extension to all government employees retiring at the age of 58 years. The World Bank has given Himachal Pradesh Rs 600-crore Development Policy Loan from the Clean Technology Fund to take policy initiatives in various core areas like climate change, watershed development and environment impact assessment of all five rivers basins due to hydropower generation. 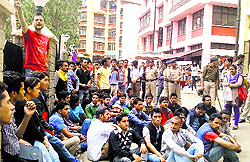 The Student Central Association (SCA) of Himachal Pradesh University today threatened to launch a statewide agitation in case the fees are hiked. The Manali administration today rescued over 120 people, including 20 tourists and 15 Buddhist monks, who were stranded due to sudden snowfall at the Rohtang Pass on Friday. State Congress president Sukhwinder Singh today met Chief Minister Virbhadra Singh to apprise him of the steps he was taking to identify and rectify the shortcoming to strengthen the party. The Himachal Pradesh Government will seek technical assistance from California University for capturing monkeys, sterilisation, prevention of various diseases and management of garbage and primate parks, said Forest Minister Thakur Singh Bharmouri here today. Chief Parliamentary Secretary Jagjivan Pal today asked government officers to complete all development works under a time-bound plan and follow the development agenda of the state government. The BJP today criticised Chief Minister Virbhadra Singh for the cancellation of letter of intent issued to Vivekananda Medical Research Institute (VMRT) led by senior BJP leader and MP for setting up a medical college at Palampur. After a gap of two years, the swimming pool at the Indira Gandhi Sports Complex will be made functional on May 26. It remained closed as the operation and maintenance of the facility could not be outsourced. The District Sports Council and the District Swimming Association made efforts to make it functional. Joint efforts, open mind and collective wisdom is the only mantra for the development of the university. Usha International, leader in sewing machine industry, gave away this year’s Usha -- NIFT ‘Best Garment Construction Award’ to Subhash Chander Burman, a student of the National Institute of Fashion Technology (NIFT), Kangra. The convocation event was held at Kangra yesterday. India is a rich repository of art and culture and Shriram Bharatiya Kala Kendra, New Delhi, is doing a yeoman service in the preservation of country’s cultural heritage. An engineering student of a private university was found hanging from the ceiling at his room in Sector 4 in New Shimla yesterday. The Consumer Forum, Mandi, has directed ICICI Lombard General Insurance Company, Mandi, to pay Rs 30,000 to the complainant along with 9% interest per annum from the date of institution of the complaint till its realisation. The decision would be subject to the satisfaction of the government. The Cabinet met under the chairmanship of Chief Minister Virbhadra Singh here today and decided to allot the controversial 15 mW Sai Kothi hydroelectric project in Chamba in favour of HP State Electricity Board (HPSEB). The HPSEB is already executing the Sai Kothi-II project hence both schemes will now be implemented simultaneously. The Cabinet expressed concern over the growing incidence of drug peddling and decided to take effective measures to check the menace. It gave nod for stray cattle policy to tackle stray cattle problem in the state. It has also been decided to fill 100 posts of agriculture extension officers in 2014-15 and 50 posts in 2015-16 on contract basis on consolidated fixed remuneration of Rs 8,310 per month through HP State Subordinate Staff Selection Board (HPSSSB), Hamirpur. The revised policy guidelines for setting up stone crushing units in Himachal Pradesh keeping in view the provisions of the environment protection laws were also given a nod. Approval was also given for the enhancement of grant-in-aid to Panchayat Chowkidars from Rs 1,650 to Rs 1,850 per month and also approved enhancement of the rates of honorarium to the office bearers of Panchayati Raj Institutions. It was also decided to regularise NET/SET qualified lecturers (college cadre) appointed on contract basis between 1997 and 2002 with effect from June1, 2014. An approval was given for amendments in the rules for allotment of plots to the Bhakra Dam oustees in New Bilaspur Township. The financial assistance to soldiers of World War-II and their widows was also enhanced from Rs 750 to Rs 2,000 per month with effect from April 1, 2014. The Cabinet also approved abolishing of 10 Van Thaanas established under the HP Forest (Van Thaana) Rules, 2010. The Cabinet gave nod for construction of Baijnath-Paprola planning area with a view to ensure sustainable development of the area. Besides, it was also approved to constitute Sangrah planning area in the Sirmaur district. The loan is not tied to any particular project or task and will go into the government kitty to promote inclusive green growth and help reduce greenhouse gas emissions. The government will take initiatives in the core sectors of forest, environment, tourism, industry, rural development and agriculture. Most of these initiatives have to be in place before December 31, 2015. “The loan has been granted by the World Bank in recognition of the various initiatives taken by the state government to conserve the environment through sustainable development,” confirmed Principal Secretary (Forest and Environment) Tarun Sridhar. He along with a team of officials had some time back visited Washington to pursue the grant of loan to the state. It was in 2007 that the World Bank had given a Rs 450-crore policy loan to the state for setting up of separate Department of Environment. In 2013, another Rs 550 crore was given to the state by the World Bank. “We are already in the process of implementing the watershed management guidelines as per the Government of India norms with thrust on people’s participation,” informed SS Negi, Director Environment and Scientific Technology. He added that the State Action Plan on Climate Change had also been prepared to assess the impact of concept like global warming and the initiatives required to tackle the situation. The department of Environment has also prepared a policy for payment of Environment Services as an initiative to encourage people to be partners in protecting the fragile hill ecology. Another very important initiative taken by the department has been real time monitoring of e-flow from various hydropower projects. “At present, we are monitoring the water discharge, which has to be at least 15 per cent from over 20 hydropower projects through satellite,” informed Negi. The department is also in the process of preparing the Comprehensive Catchment Treatment Plan of all five major river basins in the state. While the plan for Sutlej has already been completed, the one on the Chenab is nearing completion. Besides, the Strategic Environment Impact Assessment for all major river basins witnessing a lot of activity in terms of hydropower generation is also being done. SCA secretary Piyush Sewal said Vice Chancellor ADN Bajpai was planning to hike the fees after getting six months’ extension. In case, the anti-student initiative was taken, the SCA would not allow the Vice-Chancellor and administrative officers to enter the university. Demanding immediate removal of the VC, the SCA said corruption would not be tolerated in education and if their demands were not met, students would launch a statewide protest against the Chief Minister and Governor and would protest in front of their residences. SCA leaders alleged that the VC did not meet the elected body of students, Central Students Association (SCA), throughout the year. The snow had triggered small avalanches at multiple locations, burying around 35 vehicles under the snow near Rahni Nala and Rohtang top. Over 128 vehicles, with around 194 persons on board, were stranded at different places yesterday, as the Pass had experienced around 20 cm of snow. The adjoining Rahni Nala, Marhi, Rahla fall and Fatru in Solang valley had also experienced snowfall up to 5-10 cm, blocking the Manali-Leh highway. “While 72 persons were rescued to safer places yesterday, around 122 persons including 20 tourists and 15 Buddhist monks coming from Lahaul, were rescued today,” Manali SDM Viney Dhiman said. He added that all the stranded people had been rescued safely and no loss of life was reported. Commuters, generally residents of Lahaul, had moved to safer locations after sensing the danger of avalanches, thereby avoiding the tragedy. The Manali-Keylong service of Himachal Roadways Transport Corporation (HRTC) buses was withdrawn yesterday and will be restored after the weather stabilises, confirmed HRTC sources. The occasional snowfall during May has hampered the snow clearance efforts of the Border Roads Organisation (BRO) in the Lahaul and Spiti district. The district administration has alerted the residents to be cautious while crossing the Pass and avoid travelling in bad weather. The intermittent rains in the Kullu valley since past three days has lowered the temperature, while Bhuntar today recorded a minimum of 12.4°C and Manali recorded a low at 7°C. The state experienced widespread rains during past 24 hours while tribal areas and high altitude mountain passes had moderate snowfall. Keylong and Koksar recorded 12 cm of snow while Rohtang and other higher reaches in tribal belt had 50 cm to 70 cm of snow. Manmohan Singh, Director, MeT office said snowfall during May was not unusual and Tribal areas received snowfall in May in 2004, 2005, 2009 and 2012 also. The local MeT office has predicted rains, snow or thunderstorm at some places in mid and higher hills during next 48 hours. 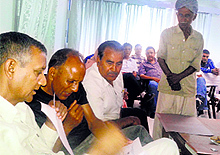 Chief Minister Virbhadra Singh had termed as uncalled for the decision of Sukhu to seeks report on the performance of the party in the Assembly segments and polling booths of ministers, sitting and former MLAs, chairmen and vice-chairmen of boards and corporation and all office bearers of the state, district and block units of the Congress. “I had a detailed discussion with the Chief Minister and apprised him of the initiative which was not aimed at fault-finding or to blame anyone but to identify the organisation’s weaknesses and take steps to overcome them,” said Sukhu. He said the main objective was to make everyone, holding posts whether in the government or party accountable. Sukhu said the Chief Minister was also keen that the party and the government work hand in hand. “There is no question of finding faults or putting the blame of the defeat on any individual, as fighting the election was the collective responsibility of all,” he said denying that it was due to poor governance that the Congress suffered its worst ever defeat at the hands of BJP. Even as Virbhadra Singh and Sukhu are attributing the party’s dismal performance in the Lok Sabha polls to the Modi wave, but an impression has been created where they are trying to put the blame on each other. Sukhu’s meeting with the Chief Minister seems to be an attempt to dispel the notion that the party and the government were on a warpath. Sukhu said he had already started receiving reports on the booth wise performance of the Congress in the polls. “The grass root workers who do not hold any big post are very happy that atleast the party functionaries and those holding posts in the organization will be made accountable and their performance will be assessed,” said Sukhu. Revenue, Irrigation and Public Health Minister Kaul Singh Thakur met AICC President Sonia Gandhi in Delhi on Friday evening. He is learnt to have apprised Sonia about the reasons for the party’s dismal performance resulting in defeat in all the four Lok Sabha segments. Former Chief Minister PK Dhumal today asked Chief Minister Virbhadra Singh to accept the responsibility for defeat in the Lok Sabha elections in the state. Talking to a team of experts from Primate Research Centre, California, led by Dr Brenda Mccowan and Dr Rob Atwill, which visited Hamirpur, Gopalpur and Shimla areas to monitor the behaviour of monkeys, the minister apprised them of the comprehensive steps taken by the government as per the International norms to check the menace. Stating that more than 83,000 monkeys were sterilised up to second week of May this year through seven monkey sterilisation centres, he directed the department to prepare a comprehensive plan in this regard. Dr Rob, medical ecologist from California said Himachal Pradesh had taken effective steps to tackle monkey menace which could be pioneering for other countries. He told officers that delay in the completion of development works not only accelerate the cost of construction, but also caused inconvenience to the public, particularly stakeholders. Pal expressed concern over the unnecessary delay in the completion of development works despite availability of funds. He said in future if development projects were delayed, personal liability of the officers concerned would be fixed. Pal laid stress on the quality of construction and said roads repaired during summers should not be washed in the first monsoon showers as it happened in the past. He said the field staff of various departments was responsible to maintain the standard of construction and they should perform their duty sincerely. He categorically stated that there would be zero tolerance for corruption. Earlier, Pal also organised a “khula darbar” at Thural and listened to the grievances of local residents. Most of the grievances were solved on the spot and he directed officers to implement his orders in 24 hours. Praveen Sharma, senior BJP leader and former MLA, said the recent decision of the state Cabinet to this effect was politically motivated with an intention to harm the health institution which was providing super-specialty health services to the people. He said Virbhadra was demoralised and frustrated after the defeat of the Congress in the recently concluded parliamentary elections, therefore he was taking such decisions. Sharma said after Virbhadra took over the reins of the state, he extended step-motherly treatment to Palampur and stalled all development activities. He said all development projects taken up during the BJP regime had come to a standstill after the Congress came to power. All development projects were facing financial crunch as the Chief Minister had deliberately withheld the funds. Sharma said Chief Minister Prem Kumar Dhumal and Shanta Kumar had laid the foundation stone for a multistory parking in the town during the BJP regime. He said the construction work did not begin as the Chief Minister did not want to see this project coming up at Palampur because of his difference with local MLA Brij Butail. He said during the BJP regime, funds for two other parking projects were released by then Urban Development Minister Mohinder Singh and its foundation stone was also laid, but no headway was made during the Congress regime and later, these projects were also shelved. He asked Virbhadra to learn a lesson from the befitting defeat of the Congress and lay stress for an overall development of the state leaving political vendetta against his partymen and rivals. Deputy Commissioner Abhishek Jain even took permission from the Election Department to conduct the tender process to outsource the pool even when the model code of conduct was in force. The pool was outsourced to a private firm from Delhi. The Deputy Commissioner inspected the pool on Thursday and directed minor repairs to be undertaken before it was made functional. He also discussed safety measures. Jain said user charges for utilising the pool would be finalised on Friday during a meeting between the sports council members and the company entrusted with running and maintaining the pool. Jatinder Kanwar, secretary of the association, said championships would be resumed as usual. He said the facility, the second in the state after Mandi, would enable young swimmers to attain better skills. This was stated by HPU Vice-Chancellor Prof ADN Bajpai while addressing the university community after getting extension for another six months as he completed his first term in the office here today. Prof Bajpai emphasised upon delivering best academicians, managers, administrators, scientists and engineers for the overall development of the society in general, and Himachal Pradesh, in particular. He said he had proposed new courses, new innovations and pragmatic steps for upgrading the facilities and improving educational standards in the university. The vice-chancellor called upon faculty members to work with dedication, discipline and devotion for the growth of the university and make it reaching The Himalaya like Heights. Present among others were faculty members, non-teaching employees and elected representatives of the university community. Usha International felicitated the winner with a sewing machine, a trophy, certificate and a cash award of Rs 10,000. The award was given by Suresh Vyas, assistant regional manager, Sewing Machines (Punjab). Playing a pivotal role in encouraging young and budding fashion designers, Usha International has been conferring the most prestigious ‘Best Garment Construction Award’ to the NIFT students since 2000. Every year, one student is recognised from each of the 11 NIFT centres, including Kangra, New Delhi, Mumbai, Kolkata, Gandhi Nagar, Chennai, Bangalore, Hyderabad, Rai Bareli, Shillong and Patna. The awardees are shortlisted by NIFT professors based on their performance throughout the year. This was stated by Chief Minister Virbhadra Singh on the inaugural function of the three-day mythological ballet fest at the Gaiety Theatre here yesterday. Stating that artists of Shriram Bhartiya Kala Kendra had infused a life in the mythological ballet ‘Meera’ by successfully capturing and enshrining the life sketch and un-parallel devotion of Meera towards Lord Krishna, he said, "Meera is one of the greatest mystic poet of our country, who had spread the message of self-realisation and awakening through bhajans." The Chief Minister said artistes of Shriram Kala Kendra must have enjoyed performing at the historic Gaiety Theatre in Shimla. He said the Gaiety Theatre heritage building was more than 125 years old and was renovated during his earlier tenure. He lauded the efforts of Language, Arts & Culture and Tourism Departments for organising such prestigious events in Shimla. He said apart from Shimla, such programmes should be organised in other parts of the state. The CM also honoured artistes by presenting Himachali caps to them. Forum president JN Yadav, while allowing a complaint filed by Hem Lata of Naginal village in Tehsil Thunag, passed an order regarding the failure of family planning operation, which was conducted at a camp in Karsog of Mandi district by the doctors of Health and Family Welfare Department. It was further directed to pay Rs 5,000 to the complainant as compensation for causing harassment and Rs 3,000 as the cost of litigation. Since the ICICI Lombard was the insurer of the family planning insurance scheme which was taken by the Health Department, it was directed to pay the amount on behalf of the Health and Family Welfare Department. The complainant underwent laparoscopic tubectomy sterilisation operation during the camp at Civil Hospital, Karsog, on December 2, 2010, but she conceived again and gave birth to a male child on August 11, 2011, who died on September 4, 2011. According to the complainant, the refusal of the payment of insurance claim on the failure of sterilisation amounts to gross deficiency in service as provided under the Consumer Protection Act.